Beth Yazhari, Mojdeh Bahar share paintings at Lakewood Foyer Gallery through the month of March. Lakewood Foyer Gallery will present "Fragments," works of art by Mojdeh Bahar and Beth Yazhari, through the month of March. Gallery curator Jan Rimerman paired the artists together knowing their artistic styles and personal history would complement each other. "For me 'Fragments' represents how my art has evolved as I've evolved," Bahar said. "From my beginning in Persian miniatures, to painting tiles and now abstracts, I see painting as powerful. I let the paint do its own thing." Bahar will exhibit water media in large format from her "We are Made of Stars" collection. Embedded in the paintings are fragments of defective silicone wafers, representing "controlled breakdown." Bahar has painted for more than 50 years, and studied under Master Mahmood Farshchian in her native land of Iran. "When I came to this country, fresh from art school in Tehran, I had no idea that my training in Persian miniatures would influence me for the rest of my life," she said. "I have been painting for over 50 years, staying very close to water media, close to Persian miniatures, and influenced by Western watercolorists." When her son was born in 1991, she found it difficult to paint so stopped painting for some time. About three years later quite by accident she discovered jewelry designer Julie Rogers who was giving a demonstration of a material called "friendly" plastic. "She helped me realize that craft projects were the way to express my art at that point," Bahar said. "I began making my broaches as fun pieces for friends. They gave it to their friends and that is how my business developed." She said that the jewelry seemed to change every time she looked at it, and people see different things in them than she does. "That intrigued me," she said. "They were my Persian miniatures. I decided to paint them. My urge was to paint them large." The transition from painting miniatures to large scale was difficult, but finally she made a breakthrough. "I still enjoy sitting down to design and draw and think on the scale of five or size zero brushes, but I also enjoy standing up and holding the two-inch brush in hand and liberating myself from the small and controlled paintings that I know so well." Yazhari says her art and Bahar's have a lot in common. Her husband is half Persian, and that has influenced her appreciation for the color, symmetry and beauty of the Persian culture. She takes delicate fragments of antique lace and embroidery from different countries and combines them into intricate compositions that reference both East and West — Amish quilts and Persian carpets are two great loves. By rescuing discarded doilies and abandoned pieces of folk embroidery and recycling them into her beaded paintings, she intentionally collaborates with the creative spirit of women of the past. Recently, Yazhari began col lecting fragments of Victorian era lace as part of a series of paintings exploring the historical creation and use of veils. Her goal is to convey the idea that the veils that obscured the vision of the women of the past, both physically and symbolically, should be removed. Delicately wrought lace garments, which both sheltered women in mourning and confined their movement, are painstakingly cut apart and reassembled into new patterns. Reconstructing these traditional articles of women's handiwork symbolizes a release of female energy and capacity. Yazhari, a Lake Oswego resident, received her Bachelor of Fine Arts degree from the School of the Art Institute of Chicago in 1998. Initially focused on painting, Yazhari also became interested in fiber arts, not only for their aesthetic but also because they focused on traditionally underappreciated media that were associated with "women's work," as opposed to the "high art" of painting on canvas. Much of her body of work has sought to challenge this arbitrary distinction of high and low art by taking beautiful, discarded pieces of lace, doilies and other fabrics that have been created by anonymous women of the past and incorporating them into works of art created on canvas that are intended to be hung on a wall. She incorporates fabric and beads from a wide variety of cultures into her work. These globally inspired pieces, with their rich detail and intricate symmetry, are sometimes compared to Persian carpets. She is also naturally drawn to themes of spirituality and social justic in her work, and at times she incorporates in subtle ways the symbols and designs from both her own Baha'i faith and from traditions of other faiths from around the world. One of her art pieces in "Fragments" will be "Remembrance of Lua," which highlights delicate fragments of Victorian lace from the 1800s and lots of vintage jewelry. "A long rose quartz necklace forms the butterfly's body," she said. "And vintage earrings and pearl necklaces from Germany and the U.S. adorn the wings. I have recycled these once-treasured items by sewnig them onto my painting of a lace doily-inspired butterfly, which is soaring in an abstract sky inspired by an antique textile design from China. 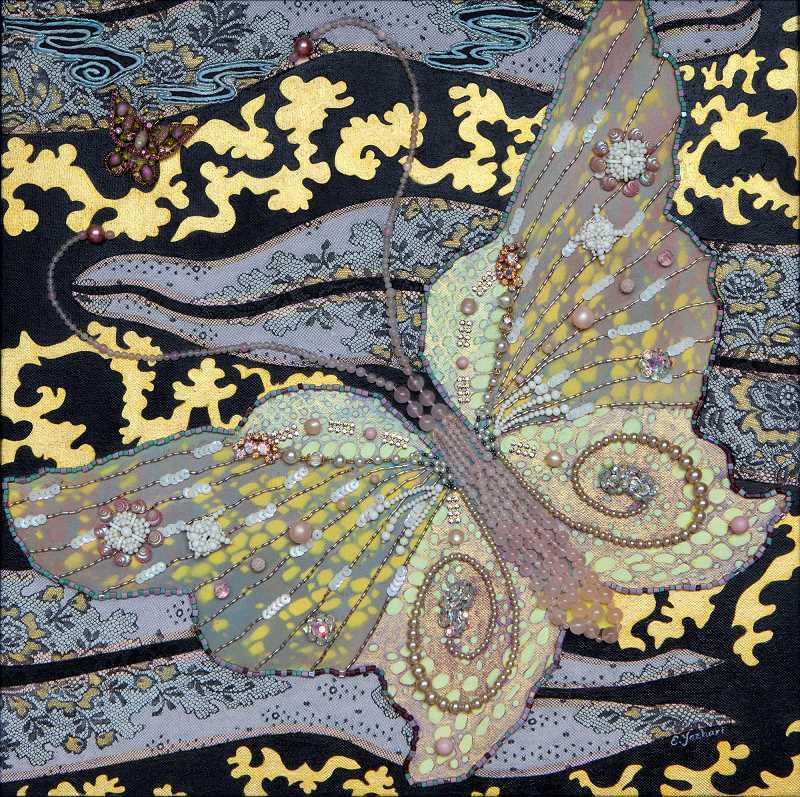 Many of my beaded paintings feature intricately embroidered butterflies, which I am drawn to both for their formal symmetry and the fact that they symbolize metamorphosis and taking flight." 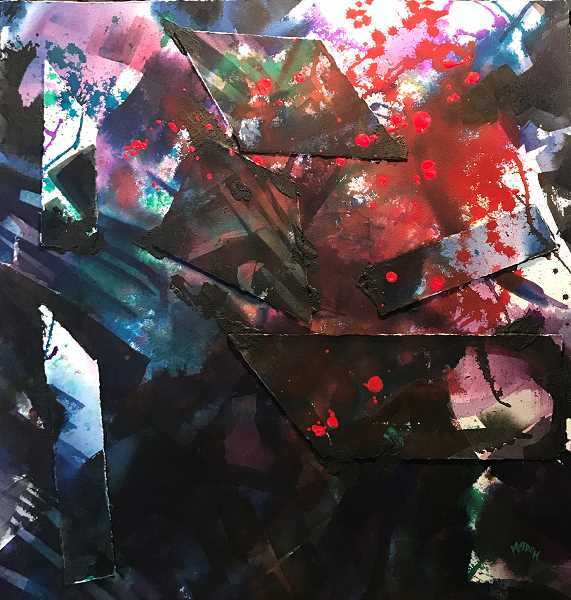 "Fragments" will be exhibited at the Lakewood Foyer Gallery at Lakewood Center for the Arts, 368 S. State St., through the month of March. The exhibit is free and open to all during Lakewood Center's regular hours. To learn more about Bahar visit mojdehbahar.com, and to learn more about Yazhari visit bethyazhari.com.